It is delirious, the nirvana, the absolute must: exhibitors are hundreds, several tens of thousands of visitors. It holds the first Sunday of June on the market place of this charming small village, where is the museum of photography. You may find everything : much of old apparatuses (of the beginning of the century), even more of recent ones, do-it-yourself items and gizmos with profusion... and even usable gear left in the gutter the evening to reduce the luggage to carry back. German, Belgians, Dutch and now Russians are here to sell. English and Italian, some Japanese, especially to buy. The best deals were made Sunday morning at dawn. Should now be gone there Saturdays afternoon; one whispers that it will be necessary to come on Friday evening. A bad place to sell, but one can give away at low price. Caution, if you want to buy: some goods may be of doubtful origin. Dress and travel light but take a protection for the rain (as it is said to happen at the 24 hours of Le Mans, it always rains at Bièvres), also take somewhat to drink and a cap, as the sun may burn too. Access by the railway station of Austerlitz, one arrives at 500 meters of the Holy of Holies (sillyness, a train each hour). By car, you will have to park one or two miles away and to walk to approach: be light ! (hypothetical shuttles, quickly saturated). In 1998 : the fair took place Sunday June 7th. The tendency is confirmed: the businesses began Friday evening. Saturday in middle of afternoon two thirds of the exhibitors were already present and many visitors. Saturday is the day of the collectors and merchants. Sunday, visitors were a little fewer than in 1997, especially in afternoon. Selling prices are rather firm. The foreign participation increases, exhibitors as well as visitors. Many foreign exhibitors also buy hard. 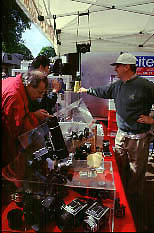 In 1999 : the fair took place Sunday June 6th. Many retailers, of which still increasing foreign exhibitors. Disturbing rainy weather, and less customers. In 2000 : the fair was on Sunday June 4th. The fair is more and more an event for professionnals and advanced amateurs. They still had played their part during Wedenesday afternoon and Saturday. Important foreign participation. In 2001 : the fair was on Sunday June 3rd. The trend is going on : the best had been trade before Sunday. In 2002 : the fair was on Sunday June 2nd. I was on the spot Saturday to buy and Sunday only to sell (and, yes, it worked fine). The French ordinary amateur custom of the Sunday is less and less interesting. The fair is more and more a meeting for professionnal of used trading coming fom all the Europe, and making their arrangement before Sunday. Attention, foreign visitors : check the schedule. In 1997 the fair was one week delayed due to unattempted national ballots. Birthplace of Daguerre, this fact gave the idea of the fair. Old and recent gear, but also old images, which make rows of stands lighter. Associations are here, of which the French stereo-club. No charge for entrance. These last years, the public and the stuff were crunching; it's a pity, as Cormeilles is an original place. Access by train from Saint-Lazare (then one mile to walk - some times shuttles but not every year). Easy access with a car by A15. This meeting has more or less taken the place of Photo-Folies as the great meeting of winter in Paris area (but the staff seems from different hands). It appears to be the most significant after Bièvres : 200 stands or so, and a bunch of visitors. Despite its name, some vintage stuff is shown, but is not the prominent attraction of the fair. 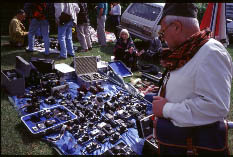 Cameras from 1970 to present are the major part. In March 2000, I went for the first time to Chelles, 30 km north-east from Paris. Perhaps 200 retailers in two rooms of the "Centre Culturel". Parking is a pain. Undoubtly the only fair to compete with Photo-Antica as the second event in Paris area after Bièvres. Note: the Orphelins Apprentis d'Auteuil no more hold on. Photo-Folies, launched in 1996 at Espace Champerret were discontinued in 1999. Other fairs are held, less interesting. Classified of magazine Chasseur d'Images. ... CdI is by far leader in France for photo advertisement. However, pretty uneasy to buy as a foreigner. PHOTIM: advertisements on Minitel 3615 keyword PHOTIM and now Photim on line .. A permanent flow of advertisements of non-professionals. Of course the jackpot is to purchase a Nikon F2 Titanium from a died collector's nephew who haven't any idea of its value. It happened (not with me); if by more the guy is an arrogant YUP, no remorse. Quite improbable in classified advertisements, their authors having a minimum of photo knowledge... but often not enough to keep their prices at a fair level. Surely the best potential deals. The professionals buy a lot there. I never bought photographic goods that way. I knew well Drouot (auction place of Paris for furniture and fine art): it is always difficult to rival professionals. both for gear in use - no collector items, which are sold in dedicated auctions. To know if it is worth buying, one must visit the previous sights to look at items before the sale.